It’s been a bit of a draining week already, I came home from work yesterday in a funk from the stressful day, it was nice to chill with these two for awhile while I decided what to do for dinner. Crazy days seem to squash my creativity in the kitchen, I wasn’t sure what I wanted, it just needed to be simple and maybe spicy. I threw together a fast saute of chopped tempeh and green beans seasoned with garlic, salt, and pepper. 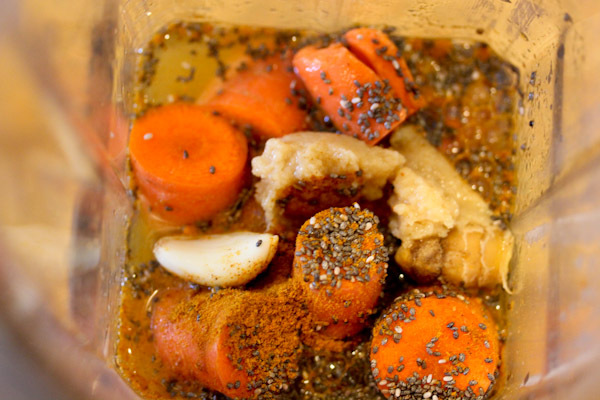 But I decided it needed more and started throwing ingredients into the Vitamix for a curry dipping sauce. What I came up with was actually good! 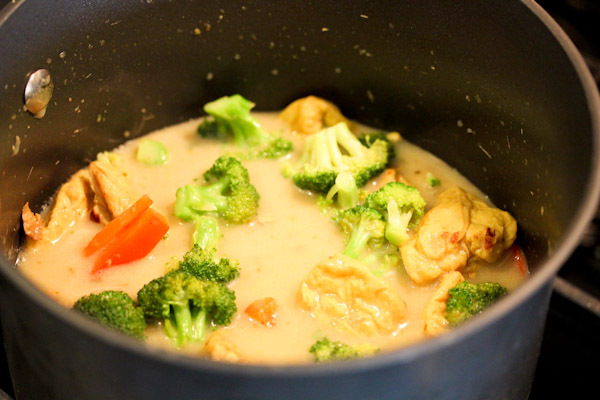 It had a strong curry flavor with a slight sweetness and thick and creamy texture. Place all ingredients into a high speed blender and blend to a smooth and creamy texture. Use as a dip, spread or dressing. Makes 4 servings. I know, I’m obsessed with curry having it at least once a week. But it’s so tasty and versatile. 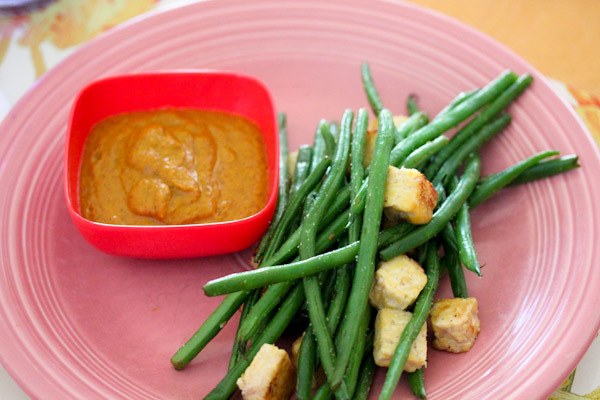 The sauce is very thick and creamy, great for dipping. And we had curry again tonight! Green curry this time. 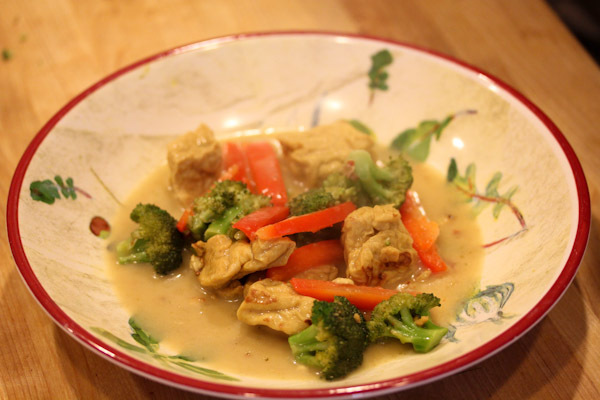 I got the pleasant surprise of hubby making dinner when I got home after another long day and he was trying to recreate one of my favorite Thai curry dishes we get from a local Thai restaurant using Hodo Soy Curry Tofu Nuggets, so sweet! 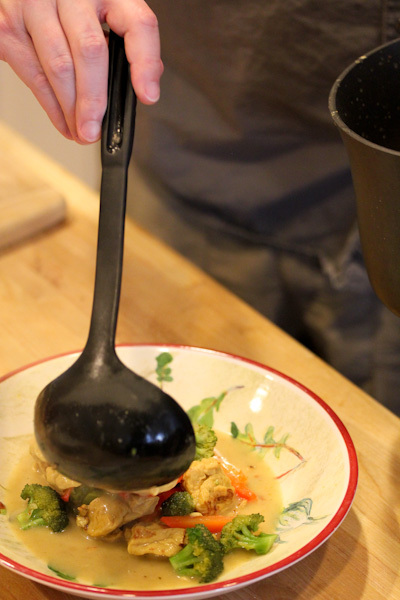 He did an awesome job using coconut milk, green curry paste, and dried red chili pepper in the soup. It was nicely spicy and the texture of Hodo Soy Tofu Nuggets was very similar to the chunks served in the That restaurant, still obviously tofu, but with a firm and flavored skin and hearty texture. There is something especially tough about this week, isn’t there? Mine has just been crazy so far. And I feel the same way about stress and my ability to be creative in the kitchen, right now I should have dinner ready and I am still trying to figure it out! There’s been a lot going on at work it seems, maybe because kids are out of school and more co-workers are out on vacation. But so hard to feel inspired when just drained from the day. Hope your week gets better!